It is a truism that almost all the major principles established by the ECJ have been decided in the context of a reference to that court for a preliminary ruling under Article 234 (ex 177) EC. Article 234 facilitates a dialogue between the national courts and the ECJ in order to allow national courts to seek guidance on the appropriate interpretation of Community law principles in a particular legal dispute. From a Community perspective, this process should enhance the uniform and consistent interpretation of Community law throughout the national courts. This book adds to a growing body of literature on the ECJ’s role in developing Community law and comprises quantitative and qualitative aspects. It is based on collaborative research, involving 14 Member States, which focused on the Article 234 procedure in relation to competition law and State aid cases. Rapporteurs were appointed in each Member State from which any Article 177/234 references had been made in relation to competition law or State aid. The results presented here follow up competition law-related Article 234 rulings to their domestic legal context, to ascertain what happened in the subsequent legal phase, when parties seek to enforce their rights or rely on other party’s obligations, on the basis of the ruling by the ECJ. • information, where available, on each post-ruling process. The research is comprehensive in reviewing all competition law-related rulings to 1 May 2004, and pioneering as being the first systematic attempt to collate detailed information on all relevant cases, including crucially the post-ruling process. This research is an important contribution to the literature on the ECJ and its role in developing a competition culture across the Community. Moreover, the importance of ensuring consistency and uniformity in the implementation of EC competition law by national courts has been given added significance following the accession of new Member States. 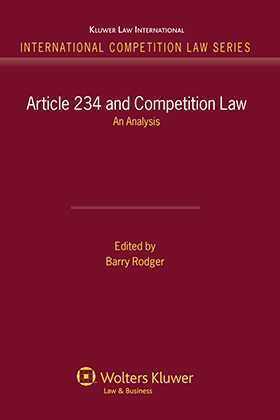 In light of these factors, this book will serve as a reliable groundwork for further studies of the development of European integration, particularly as it focuses on competition law, an area of ever-increasing significance and importance. It is also of distinctive value to practitioners seeking precedents or juridical context on which to build arguments in European competition law. Part I: Introduction and Analysis; B. Rodger. 1. Introduction: Background and Research Methodology. 2. Number and Source of ECJ Rulings. 3. ECJ Rulings and the Post-Ruling Process.